Channel One has always tried to use its news stories to help promote the Channel One brand. It was no different with their Iraq War coverage. Morgan Wandell, Channel One’s president of programming evidently gave the green light to Channel One’s unique style of interviewing military personnel. They used their access to troops to conduct a marketing campaign to try to bolster their appeal to their captive audience back home. When Channel One knew a soldier’s high school had a contract with their company, they would call the soldier a “Channel One alumnus” and would display the name of his or her high school and the city and state. If a soldier was not from a school that had Channel One, then their high school name, city and state were not identified. On March 28th, for example, Channel One’s reporter Seth Doane interviewed four soldiers. Three of the soldiers were identified with a Channel One logo under their name. Did they give Channel One permission to do this? The fourth soldier was simply identified by his rank, name and service. Sgt. 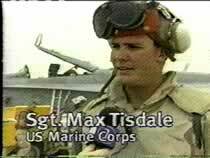 Max Tisdale, US Marines Corps, either refused to help Channel One News promote its product or he graduated from a high school without a contract with Channel One News. 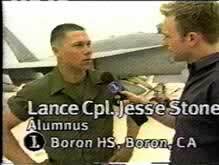 Either way, Channel One didn’t list his high school even though he was as young as the other interviewed soldiers. Why no high school name for Sgt. Tisdale? feeling to their audience that Channel One is in many schools, when in fact a minority of secondary schools have a contract with this company. 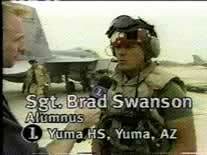 Can you imagine NBC News interviewing a soldier and on the screen we see “Sgt. Bob Smith, His family watches NBC’s Today Show”? Whether a soldier’s high school has a contract with Channel One or not has nothing to do with the interview. Channel One can plug their show in other ways, but what they are doing here is offensive. These military personnel had no control over their school renting TV sets from Channel One. To call a soldier or any graduate of a school with a Channel One contract, a “former Channel One student” is absurd. That school may have served Acme hotdogs in their cafeteria for years, yet you would not call a graduate a “former Acme hotdog student.” Channel One is merely one of many vendors in a school. Channel One News has gotten away with calling schools “Channel One schools” and students “Channel One students” like they have a Channel One brand on their foreheads, for far too long. Students and educators should not allow Channel One’s employees to refer to them in this way. Obligation is preparing a letter to the appropriate Pentagon office urging them to investigate Channel One’s actions.